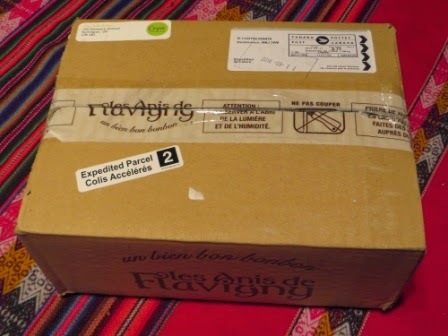 Today I received a box in mail. 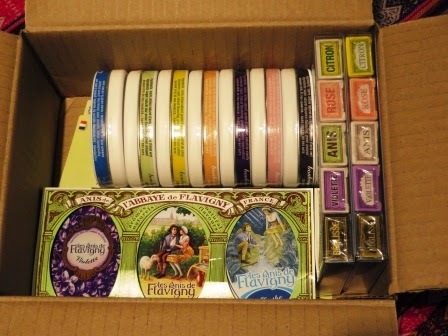 When I opened it, I was delighted to discover Anis de Flavigny candies inside to sample and share. Whoohoo! 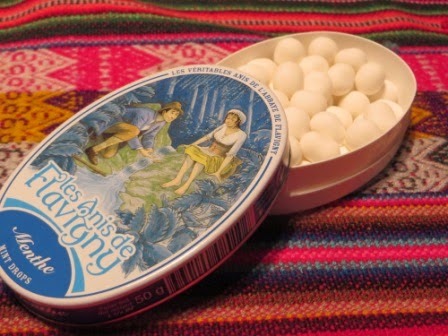 Anis de Flavigny sweets: little white pearls with an authentic, fresh and delicious flavour. First produced several hundred years ago, they weigh no more than a gram, are produced by hand, are always trendy and are enjoyed by young and old. In keeping with tradition, green aniseeds are gradually enrobed in delicately flavoured liquid sugar over the course of two weeks. This original recipe guarantees a sweet that is free from all artificial colorings, sweeteners, flavorings, preservatives and GM ingredients. Anis de Flavigny come in seven subtle all-natural flavours, spiced or floral, to please as many of you as possible: anise, orange blossom, mint, liquorice, rose and violet. The Anis are home-made in the family owned factory of 30 people, which is in the old abbey of Flavigny-sur-Ozerain. Flavigny is a village of 300 people, listed as one of the hundred prettiest villages in France (also where the movie, Chocolat, was filmed). I tried the mint ones right away ... yum! Since 1591, Les Anis de Flavigny have been made in the Flavigny village of France using the original recipe developed by monks. 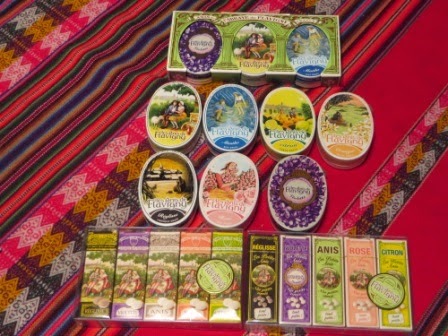 Each candy contains a real aniseed, which hold a warm, spicy flavour and an aromatic scent. The aniseed is gradually enrobed in delicately flavoured liquid sugar over the course of two weeks to produce the smooth pearl-like candy - a process called "dragée." 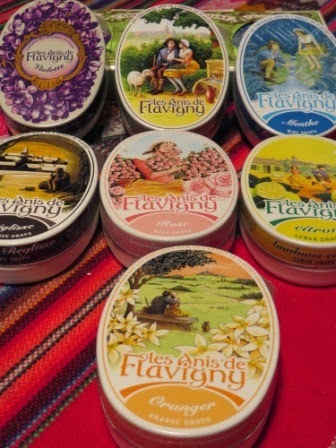 In addition to the charming oval tins (already available in Canada), new pocket-boxes of Les Anis de Flavigny in a variety of flavours will be available in Canada in September 2014. The new boxes pay homage to the old-fashioned rectangular boxes that Anis de Flavigny were originally packaged in hundreds of years ago. 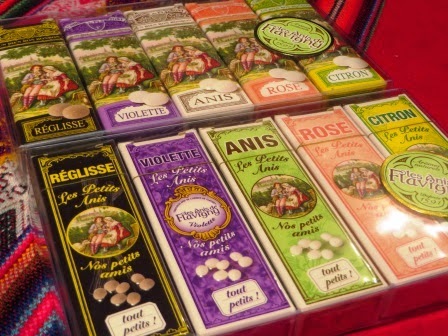 The new boxes contain the Original pea-sized candy, or the smaller rice-sized candy, Les Petits Anis®. 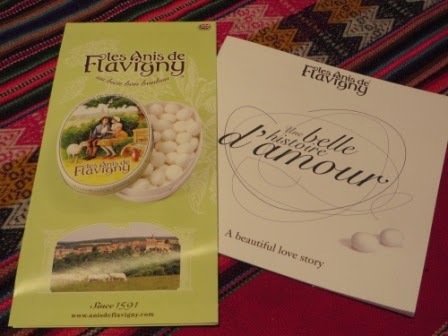 Beautiful illustrations on the packaging tell an evolving love story of a shepherd and shepherdess. 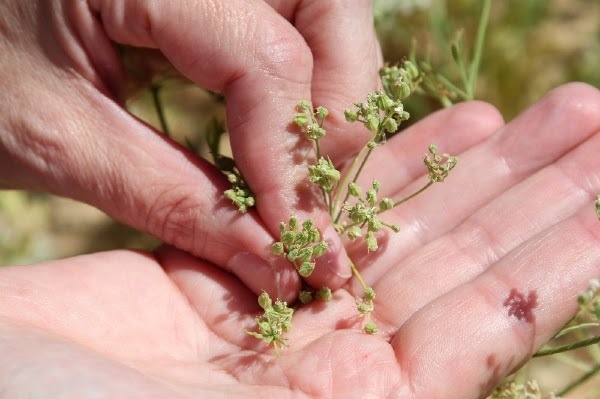 Sharing a candy that holds an aniseed has traditionally been a symbol of love, happiness and fertility. The factory has been owned and operated by the Troubat family since 1923 and continues to operate on the traditions of the abbey’s monks. 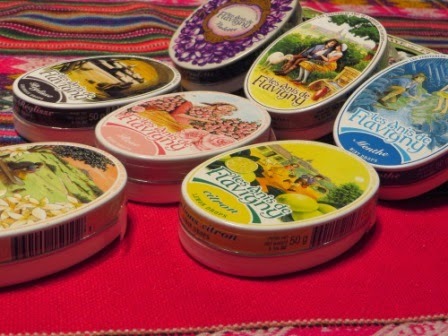 I love these, and until we downsized, I kept all the tins.